Mike London won just enough in Charlottesville to save his job last year, but not enough to remove all of the “hot seat” talk around his name. With 2015 approaching, Mike London is probably thinking that one of the toughest non-conference schedule’s in the country in a year where he needs to make a bowl game was a bad choice. With Greyson Lambert’s decision to transfer to Georgia, Matt Johns should be the clear-cut starter at quarterback. In fact, part of the reason Lambert did transfer is that Johns emerged from spring practice ahead of Lambert on the depth chart. Johns was so-so in filling in for Lambert last season, when the latter missed some time because of injury. However, with the job officially being his, maybe Johns will be able to take a step forward. An experienced receiving corps should ease Johns’ transition into the role of full-time starter too. Canaan Severin and Andre Levrone both return at receiver. Severin led the Cavs in receiving yards last year with 578, and Levrone was a deep threat with 15 catches for 248 yards. One area of improvement that Levrone needs to focus on is the fact that he only caught 35% of his targets. Obviously, that’s not all on him, but still that’s pretty low. 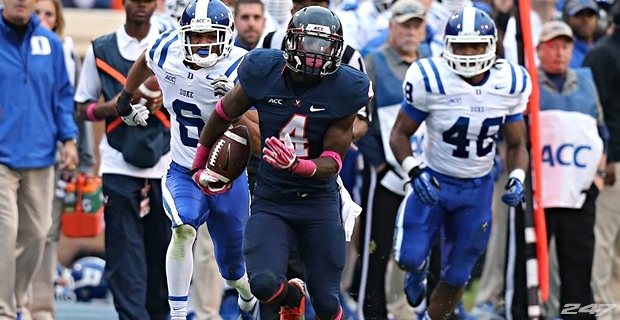 The ‘Hoos should also get a boost from UNC graduate transfer T.J. Thorpe. Thorpe was a highly recruited player out of high school, but his college career to date has been marred by injuries. Taquan “Smoke” Mizzell is a legitimate receiving threat out of the backfield too. Mizzell caught 39 passes for 271 yards last year, and had 280 rushing yards as the third running back in the rotation. “Smoke” has been largely disappointing since earning five-star honors in high school, but maybe with a clear path to playing time as the number one option in the backfield he will finally start to shine. A line that was reasonably good in pass protection, but not very good at run blocking, returns three starters and four other players with starting experience. Eric Smith was listed as the second-string right tackle coming out of spring behind redshirt freshman Jake Fieler, however I’d be surprised if Smith, a player with twenty career starts, doesn’t see a fair amount of playing time. Next to whoever ends up playing right tackle is Ross Burbank who has fifteen career starts. 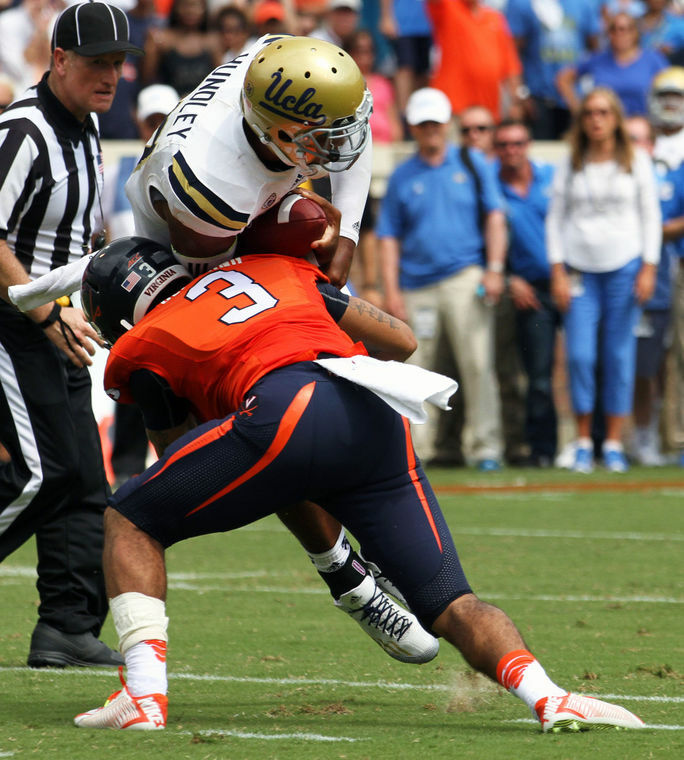 Quin Blanding emerged as a legitimate star last season as a true freshman with 91.5 tackles and three interceptions. Blanding certainly showed why he was a five-star recruit in high school. Cornerbacks Maurice Canady and Tim Harris return, and while Harris wasn’t a starter last season he played in ten games and recorded an interception and four pass break-ups. Canady was a force at corner with three interceptions and twelve passes broken up. 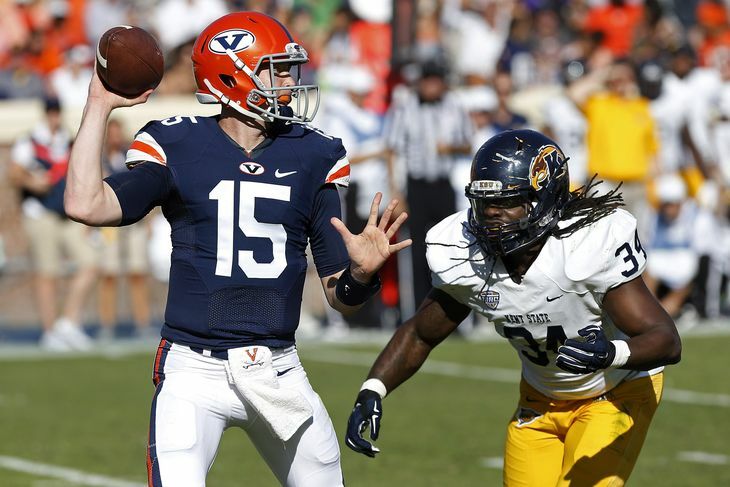 The ‘Hoos will have to find three new starters at linebacker, but have the three backups from last season back and a potential impact freshman to step in at linebacker. C.J. Stalker is a true freshman, but he is expected to step in and play, if not start, from day one. Micah Kiser, Mark Hall and Zach Bradshaw were the three backups last season, and each of them saw playing time in ten or more games last year. Kiser had 12 tackles in 12 games as a true freshman in 2014. Eli Harold is the only major loss on the defensive front, but he is a big one. Harold had 14.5 tackles for loss and seven sacks last season. David Dean and Mike Moore return to the line after each having eight tackles for loss last season, but they did only have four combined sacks. Kwontie Moore is expected to replace Harold at defensive end after recording two sacks in limited playing time last season. This team is better than your average four-win team and probably better than most five-win teams, but the schedule is just brutal. UCLA, Notre Dame and Boise State are all legitimately top 20 opponents and that is just in non-conference play. Virginia does avoid Florida State and Clemson, which helps, but they also have to go to Miami, Louisville and Pitt, none of which will be easy games. Virginia Tech and Georgia Tech both come to Charlottesville. Unfortunately, this will likely be Mike London’s last year as the Virginia head coach unless this team makes major strides against stiff competition this season.